Rotates and holds steady for viewing. Transparent sleeves hold business cards (sold separately). Includes 200 clear sleeves and A-Z index guides. Keep contacts close at hand in this easy-to-organize, solid wood rotary file enriched with soft curves and a beautiful finish. Rotates and holds steady for viewing, making locating contacts quick and easy. Transparent sleeves hold business cards (sold separately). 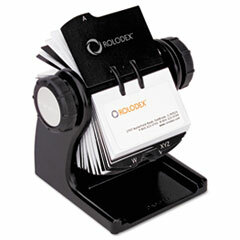 Includes all you need to get your business cards organized: 200 clear sleeves and A-Z index guides. Color(s): Black Depth: 5 3/4"
Depth [Nom]: For Card Size: 2 5/8" x 4"
Global Product Type: Card Holders-Address Card File-Rotary Height: 6 1/8"